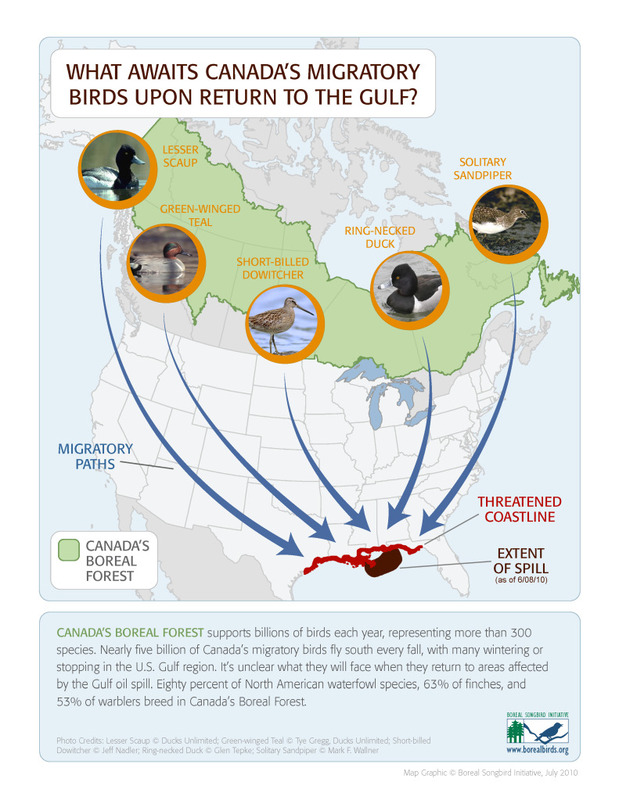 Because the Gulf of Mexico provides wintering habitat for millions of Canada's migratory birds, concern has increased about the boreal species' return this fall. 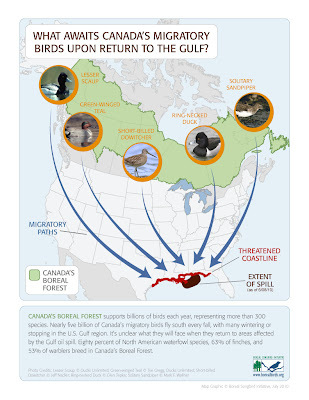 The migratory birds of Canada’s Boreal Forest represent a significant percentage of the birds that winter in the Gulf Coast region or stop during their travels farther south. As the world’s largest intact forest, Canada’s Boreal Forest is home to more than 300 bird species, including 80 percent of North American waterfowl species, 63 percent of finches and 53 percent of warblers. Wells and other experts are concerned that the birds could face long- and short-term negative effects to shoreline habitat, necessary food sources and health. Currently, nesting birds such as terns, gulls and pelicans are hit hardest by the oil spill. Louisiana’s coast supports an estimated 77 percent of the U.S. breeding population of Sandwich Tern, 52 percent of Forster’s Tern and 44 percent of Black Skimmer. Many of North America’s most at-risk species also live in the region during a portion of the year, including Yellow Rail, Black Rail, Snowy Plover, Piping Plover and Short-billed Dowitcher. The oil spill could pose long-term implications for the health of their total populations. As I feared, the BP oil spill has passed from the public consciousness with the waning of the news cycle; trapped miners are the current mini-series. BP, having capped the leak, are perceived as having solved the problem. In fact, their frantic efforts to "make the problem go away" have worsened the disaster's ultimate impact, and our children will still be dealing with the consequences. Another problem not too much is said about ia all the4 disperced in thr Gulf waters. TAHis may have a greater impact than the oil in the mardhes.